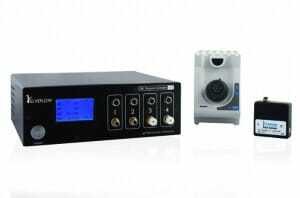 We developed a temperature controller meeting cell biology studies requirements. It reaches below ambient temperatures for efficient microtubules depolymerization or endocytosis arrest, it shifts from 5 to 45°C in less than 10 seconds and thus prevents gradient formation inside the sample, it uses electronic control for steady temperature control and microfluidic technology to prevent fluid-flow shear stress on biological samples, it fits any microscope setting. Data presented here have been published by Velve-Casquillas et al., 2010 in Lab on a Chip. Need advice to control spindle assembly using temperature ? 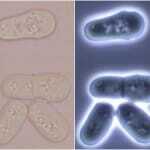 The use of fission yeast temperature-sensitive mutants has contributed to the discovery of new genes involved in yeast biology. 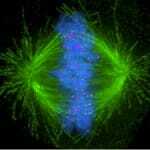 They also have been used to gain better understanding in essential genes function. Indeed, essential genes have a critical role and mutations in those genes lead to lethal phenotypes, thus preventing further insights on their actions. (Ben Aroya et al., 2010). Temperature sensitive mutations are often missense mutations. 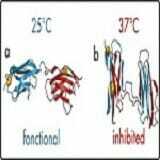 Mutated proteins retain their functionality at low, permissive, temperature but at higher, restrictive temperature, they become inactive. Fission yeast biology is intrinsically sensitive to temperature. Furthermore, at low temperatures microtubules depolymerize. Here, we present the validation of ElveflowTemp use for efficient cytoskeleton studies and cell cycle phenotype analysis. ElveflowTemp temperature controller device, our PDMS chip, is composed of microchannels allowing the circulation of thermalized fluid. The chip is connected to Peltier devices set at two different hot/cold temperatures making possible to quickly change from low to high temperature. Our chip is mounted on a thin glass coverslip, that comes on top of the biological sample. Spacers can be used depending on sample thickness. In our system, the fluid is never in contact with the sample thus preventing any shear stress. Cell imaging and microscopy Microtubule depolymerization experiments were performed on cdc25-22expressing GFP-Atb2 tubulin. 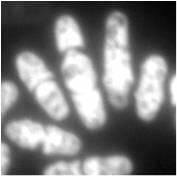 Mitotic spindle experiments were done using temperature sensitive cut7-24ts expressing GFP-Atb2. Images were acquired using a Yokogawa CSU-10 spinning disc scan head on a Nikon TE2000e inverted microscope. 3D imaging was done using a 100/1.45 NA objective, Metamorph 7.5 software for microscope and Hamamatsu ORCA-AG-CCD camera control. To validate the efficacy of ElveflowTemp, we used GFP-Atb2 tubulin expressing yeast and follow fluorescence in vivo. 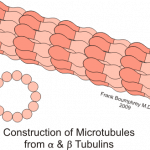 At 22°C, microtubules exhibit a typical elongated shape (Fig1A). 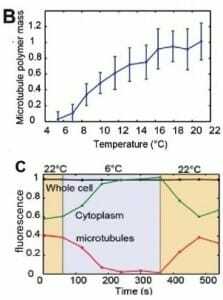 At 16°C, we could already quantify a decrease in microtubule polymer mass (Fig1B), and we observed a complete depolymerization when cells were at 6°C (Fig1A and 1B) with a loss of microtubule-associated fluorescence signal (Fig1A) and an increase in cytoplasmic-associated fluorescence (Fig1C). This suggests that tubulin dimers were released from the microtubules and moved to the pool of free-tubulin dimers. We found that the time to reach full depolymerization was cell-size dependent. 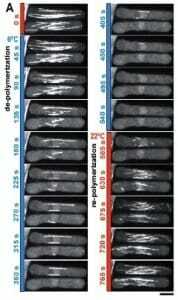 This process was reversible, and microtubules repolymerized when we shifted back the temperature from 6°C to 22°C. Using our temperature controller, we could efficiently monitor cold-induced microtubule depolymerization and re-polymerization while at the microscope stage. We next wanted to validate the induction of temperature-sensitive mutant phenotype using our device. To this aim, we used Cut7-25ts expressing GFP-Atb2 yeast. Cut7 is a kinesin protein, involved in mitotic spindle formation. At restrictive temperature Cut7-25ts mutant do not form bipolar elongated spindle. At permissive temperature (22°C) bipolar spindle is correctly formed and visible with GFP-Atb2 protein (Fig 2A and B). Few minutes after we shifted to 35°C, the restrictive temperature, the bipolar spindle retracted and adopted a monopolar shape (Fig2B), this was characterized by a shortening in spindle length (Fig2C). When we shifted the temperature back to permissive level, we could revert the spindle phenotype (Fig2B) and retrieve original spindle length after a few minutes (Fig2C). 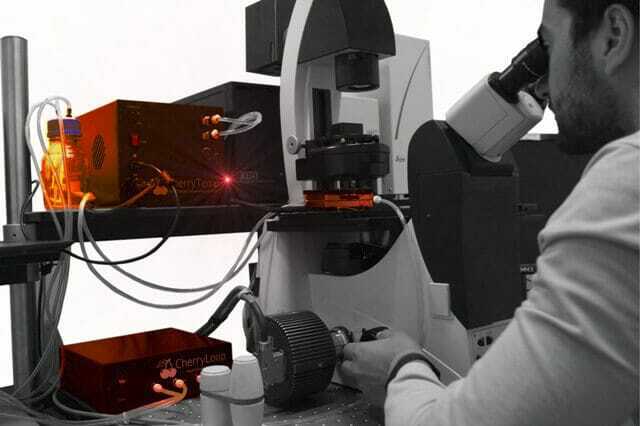 We developed and validated an ultra-fast temperature controller, fitted for live-cell and microscope imaging requirements. ElveflowTemp enables scientists to shift from 5 to 45°C in less than 10 seconds. 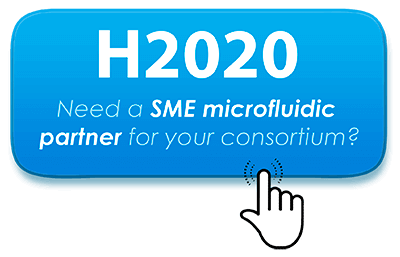 This is possible thanks to the small length of our microfluidic chip and electronic control of temperature. Existing temperature controllers (incubation box, objective heater system, microscope stages) requires several minutes to switch temperature or generate strong thermal-gradient (>3°C). Yet, it is very important to prevent thermal gradient formation on the sample and thus cancel any possible temperature gradient generated artifacts. Because the temperature-switch is very quick, we could induce and revert cut7-25ts phenotype in minutes and test for how long protein inactivity can be maintained before phenotype-rescue. The device we developed allows biologists to test below ambient cellular processes with no shear stress on the cell. We showed that in this context, microtubules depolymerization and repolymerization was efficient using ElveflowTemp. Need an accurate heater-cooler system to control yeast spindle assembly ? Need a fast drugs switch system for your yeast studies ?